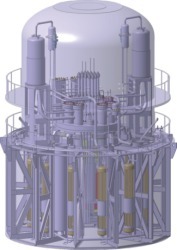 Apart from programs to develop large sodium-cooled fast reactors, Russia is also pushing ahead with a small modular fast reactor cooled by lead-bismuth eutectic, the SVBR-100. The unit is described as an integral design because the steam generators and reactor core both sit in the same pool of coolant - lead-bismuth at temperatures in the range 340-490 deg C. It would be factory assembled and shipped to site in a module measuring 4.5 metres in diameter and 7.5 metres high ready to be placed within a tank of water that provides passive cooling and radiation shielding. The SVBR concept has already run on seven Alfa-class submarines, as well as within experimental land-based installations, giving a total of about 80 reactor-years of operating experience. In 2009 AKME-Engineering was set up as a 50/50 joint venture between Russian state nuclear company Rosatom and Irkutskenergo of En+ Group, aimed at commercializing the technology. The plan is to complete the design development and put on line a 100 MWe demonstration plant by the end of 2017, with total investment of RUR16 billion ($585 million). The site is to be the Research Institute of Atomic Reactors at Dimitrovgrad - Russia's largest nuclear research centre. The SVBR-100 could be the first reactor cooled by heavy metal to generate electricity. It is described as a multi-function reactor for power, heat or desalination and a power station with 16 such modules would be expected to supply electricity at lower cost than any other new Russian technology, said AKME, while achieving inherent safety and high proliferation resistance. Russia separately has a major program to develop the BN series of fast reactors. The BN-350 prototype operated for 27 years in Kazakhstan, providing power for water desalination as well as the grid, while Beloyarsk 3 is a BN-600 in operation and Beloyarsk 4 is a BN-800 currently under construction. Two more BN-800s will be built in China under an agreement signed in October 2009 and construction of the first should begin next year at Sanming in Fujian province. They will produce 880 MWe gross each.